Use the drop down menu below to jump to a specific section. Holistic Nursing refers to a kind of nursing practice which focuses on treating the patient as a whole as opposed merely treating the symptoms of their present condition. A holistic nurse, also called a complementary health nurse, is a board certified RN who takes a mind-body-spirit-emotion approach to the practice of traditional nursing. Holistic nurses often employ alternative forms of medicine alongside traditional Western medicine in their practice. This may include dietary advice, acupuncture, therapeutic massage, and meditation therapy. 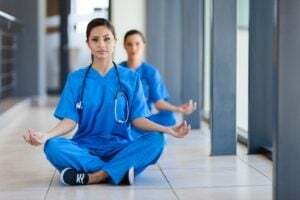 Those practicing holistic nursing often will encourage patients to integrate self-care, self-responsibility, spirituality, and reflection into their lives so as to help maintain a proper balance of mind, body, and spirit. What Are the Educational Requirements for Holistic Nurses? Like RNs, holistic nurses must attend college or university so as to obtain their BSN or ADN. After obtaining a BSN or ADN, nurses are subsequently eligible to sit for their state's NCLEX-RN examination. Holistic nurses, like RNs, are required to pass the National Council Licensure Examination (NCLEX-RN) before they are permitted to work. Both a BSN and ADN can lead to entry-level nursing positions; however, the majority of employers will favor candidates that have earned their bachelor's degree. Although it isn't explicitly required to become a holistic nurse, some RNs who wish to advance in the holistic nursing field will choose to enroll in master's programs with concentrations that focus on holistic nursing. These degrees often will lead to higher paying positions. Are Any Certifications or Credentials Needed? Upon passing the NCLEX-RN, RNs can apply for certification in holistic nursing through the American Holistic Nurses Certification Corporation. To be eligible for certification, RNs are required to show proof of continuing education in holistic nursing and must complete and pass both a qualitative assessment and quantitative exam to earn certification. Where Do Holistic Nurses Work? A significant portion of practicing holistic nurses work in private practice establishments, birthing centers, or even privately out of patients' homes. Some are even found in a traditional hospital setting, however. Since there are many alternative methods and techniques of medical practice that are used in this field of nursing, holistic nurses do not always require the same kinds of equipment that traditional nurses must have. This allows them increased access to work through other venues, venues that traditional registered nurses usually wouldn't be authorized to use. What Is the Role of the Board Certified Health & Wellness Nurse Coach? What Is the Difference Between Holistic and Traditional Nursing? What Does a Holistic Nurse Do? Holistic nurses use a combination of Eastern and Western medicine to treat patients and teach their communities about wellness and preventative health care. For a holistic nurse, the health of a human being entails more than just their physical well-being., True wellness in a person will encompass not only physical health, but psychological, emotional, spiritual, and social health as well. As clinicians, it is the duty of the holistic nurse to provide a high standard of holistic care for their patients so as to help them maintain full spectrum health. What Are the Roles and Duties of a Holistic Nurse? Holistically assess patients, using traditional nursing concepts and therapeutic communication techniques to help identify a range of factors that could be potential contributors to increased stress.